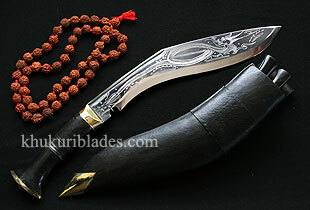 Dragon series kukris are kukris engraved with dragons on both sides of the kukri. It is purely hand made carving done by skilled craftsman using only domestic tools to show more craftsmanship on the blade. Dragons spiritually believed for wealth, health, prosperity and power although influenced from China is very much believed by Nepalese also. These dragon carving are done in many sizes from 4" to 36" blade. Here are some few names of kukris Khukuri House Thamel do carvings on. Paper knife, biltong, super mini 6", mini jungle, sirupate, bhojpure, angkhola, long 18" sacrificial to name a few. However, this house can carved army kukris too but only on order or request as we intend to keep the army kind as real as it must be.